From the Home screen, you can touch and hold Home to quickly access the Recent apps screen and a link to the Task manager. Recent apps allows you to quickly return to recently used apps. When you exit an app by touching Home , the app is saved in its current state and will remain active in the background. When you touch Back , the application will close in its current state. Pressing either key will add the app to the list. The name of each app is displayed under a large thumbnail of the app, along with the app's icon. Using your finger, you can scroll left and right through the list of recent apps. The last app used will always appear on the right. 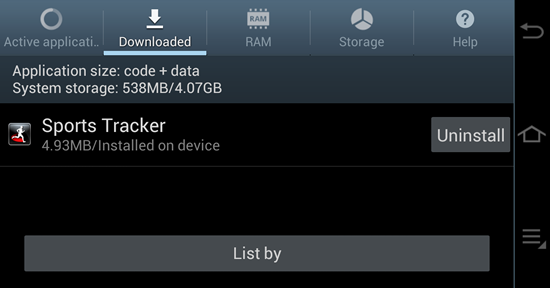 Touch and hold an app in the list to view its App info or to Delete from list. You can also touch and swipe any app's thumbnail up or down to dismiss it from the list. To switch to the app, touch the app thumbnail. To remove all applications from the list, touch Remove all . The Task Manager is a simple app that offers quick memory management. You can view and exit apps running on your device. You can uninstall apps you have downloaded. 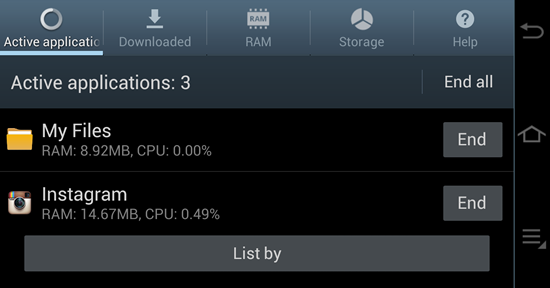 You can even free up system resources and view the amount of free space available on your device. From the Recent apps screen, touch Task manager . The Active apps tab displays all of the apps running on your device. Touch List by to select how task manager should order the active apps. Touch End to end an app, or touch End all to end all running apps. You should save any information you might need in each app before exiting the app. 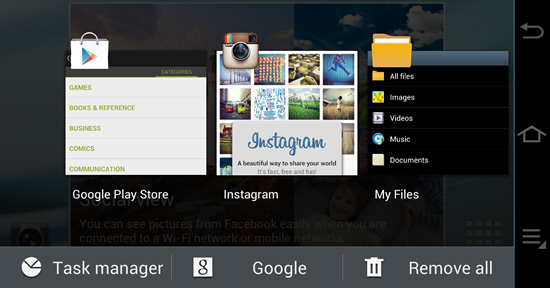 The Downloaded tab displays all of the apps downloaded and installed on your device. Information such as the amount of space the app takes up is also displayed. This tab is where you will come to Uninstall an app from your device. 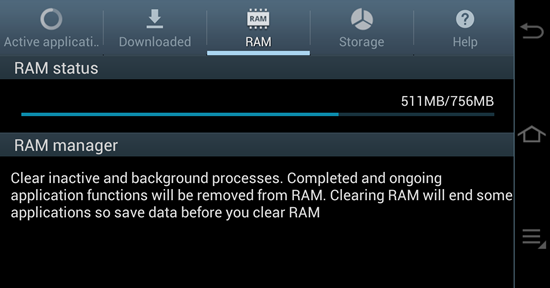 The RAM tab displays the random access memory (RAM) usage. RAM is the memory location your device temporarily loads information into when executing an app or using other device functions. If the RAM status indicator is full, clearing the RAM on your device will improve its performance when you experience slow response. 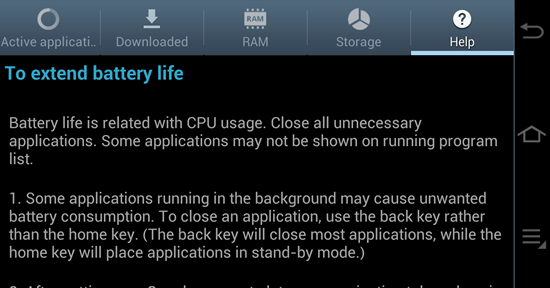 Touching Clear memory will not uninstall apps from the device, but it will end certain open apps. 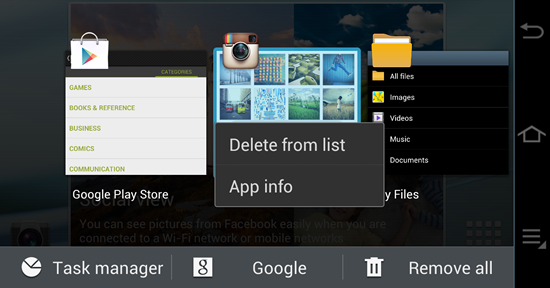 Before touching Clear memory, make sure you save any wanted information in open apps. The Storage tab displays a summary of your device's system storage, used and available, and the amount of information stored on an installed microSD card. 144 people found this helpful.